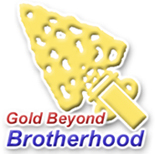 The Beyond Brotherhood Program is a award system that recognizes Arrowmen who are Brotherhood or Vigil who continue to stay active going to lodge events. 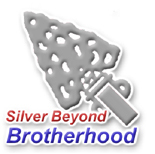 The first time a recipient gets the “Silver Beyond Brotherhood.” and for the 2nd, 3rd, 4th, 5th, etc. the recipient will receive the “Gold Beyond Brotherhood.” The Silver and Gold Beyond Brotherhood is a pin that Arrowmen can wear on there uniform, usually on the lodge flap, not on a sash. brotherhood program, click on the respective arrowhead.